Arsenal boss Arsene Wenger has said his team may have been guilty of taking their place in next season's Champions League for granted. The Gunners have slid to fifth in the table, two points behind fourth-placed Everton going into their game with West Ham at Emirates Stadium on Tuesday. "Maybe yes, we felt 'that is done'," said Wenger when asked if the squad had assumed they would make the top four. 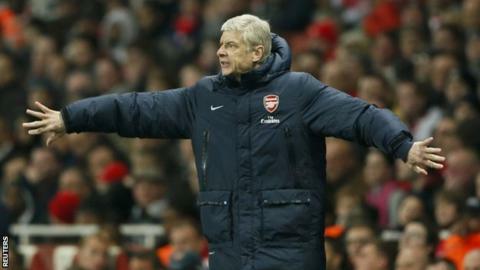 Wenger added it was "vital" his side reached the Champions League. Arsenal, who have played in the Champions League for 16 consecutive seasons, set the early pace in the title race and were leading the table as recently as 20 January. But a disappointing run, featuring heavy defeats by Liverpool, Chelsea and Everton, has left the Gunners in a battle to qualify for Europe's top club competition. "We have had a difficult schedule [this season] and the weight of a negative result, the mental aspect of a negative result in a big game, is massive," added Wenger. "To deal with that is very difficult and when you have a succession of big games one after the other, if you lose the first one you are always in trouble." Arsenal beat Wigan 4-2 on penalties on Saturday to reach the FA Cup final, increasing the prospect of ending their nine-year trophy drought. Wenger has often been criticised for prioritising a top-four finish over winning a trophy, and once again he was at pains to emphasise the importance of competing with Europe's best sides. "For many years I was sitting here and had to convince you that it was important that we were in the top four - now it is in a reverse position, you say to me 'you realise how important it is for us'. "It is vital to me to do it. I want this club to play in the top-level competition, and for that you want to be in the Champions League. "The pain of not having it? I would like them [the players] rather to concentrate on the pleasure to be in it. "It is vital for the young players as well. You learn more by playing against Bayern or Barcelona or Real Madrid than if you play in the Europa League, that is for sure." Wenger admitted having another important game so soon after the gruelling 120 minutes at Wembley was "not welcome", but said he believed the victory could lift his players. "If we had gone out [of the FA Cup], it would really have been terrible. The fact that we come out in a positive mood will help us to recover. I believe physically we can cope with it," he said.